You want to leave a message and decorate it with symbols and smileys a bit so they are highlighted and unique eg. on Facebook.com / Twitter.com or Instagram.com. 1.) ... Define the unicode character Charmap and test it on FaceBook! 2.) ... Can i Use this Character Map Solution for Twitter and Instagram! 3.) ... Define more Chars per Line: Hello ♚! Please always use ... the latest version of QuickTextPaste for Windows! 1.) Define the unicode character Charmap and test it on FaceBook! and defined it for a Keyboard shortcut. Important is only that the special characters separated by a comma, and that the text / command starts with charmap: so that the program recognizes that there is a charmap. You can use this also for other sites or programs not only for Facebook uset it for Twitter, Instagram, WhatsApp Web, ... and other. You can also create and use long text filled with special characters, such as "After ☂ rain comes the ☀ Sun"
See here : ... How to create Selection of text fields for single hotkey (keyboard shortcut)? 2.) Can i Use this Character Map Solution for Twitter and Instagram! Yes you can use this Character Map Solution for Twitter and Instagram! 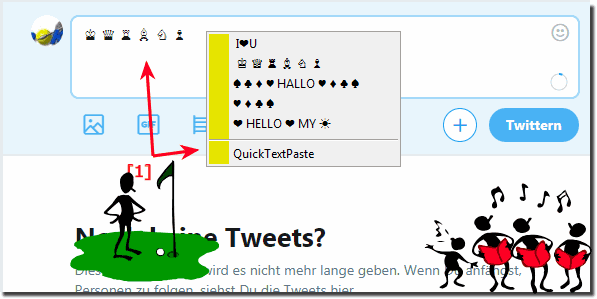 (Image-2) Insert unicode on Twitter from a character set! 3.) Define more Chars per Line Hello ♚! (Image-3) more chars of unicode character set with QuickTextPaste! QuickTextPaste - FAQ-4: How can I insert symbols from unicode character set in Facebook with QuickTextPaste? Smilies from the Unicode characters fit into Facebook. Smilies from the Unicode characters fit into Twitter. Smilies from the Unicode characters fit into Instagram.